You are here: Home / COCo Highlight / Our CoClicCo Social Media Trainings are Back! 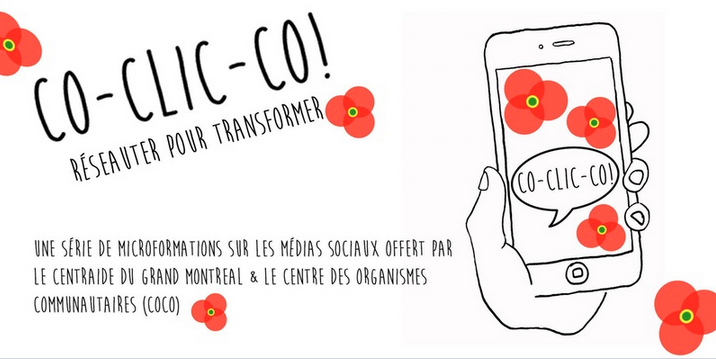 Our CoClicCo Social Media Trainings are Back! For a second year, COCo will be offering a series of trainings about social media for community organizations. This series of 4 short and interactive learning capsules, adapted to the context of community groups, aims to explore the opportunities social media can offer for the community sector and to deepen your comfort with the tools available. We want to answer the question: how can Facebook, LinkedIn, Instagram and other social media platforms be powerful tools for our outreach, our mobilization, and sharing our impact? Each training costs $75.00, but you can buy a ticket for all 4 for $200. If you want to register for all four training, simply click on the blue button “Selectionnez une date”, choose one of the available dates, and click “Billet”. You can then choose the option “Quatre formations à prix réduit”. https://coco-net.org/wp-content/uploads/2017/10/coclicco.png 359 716 Kira Page https://coco-net.org/wp-content/uploads/2015/01/COCo-Logo-No-Text-300x165.png Kira Page2017-10-02 17:30:182017-10-02 17:30:18Our CoClicCo Social Media Trainings are Back!